Grandma said they’ll eat when they’re hungry. But if you’ve ever worried your child isn’t eating enough. Or getting anything healthy in, here are 5 Parent Tips for Picky Eater in Summer. These 5 Parent Tips for Picky Eaters in Summer were sponsored by One A Day with Nature’s Medley. Summer is here! The kids are out of school and schedules are a lot laxer. After being a slave to the alarm clock for 9 months, you can finally relax and enjoy a slower pace. Or at least that’s the plan. But if your family is anything like ours, you also might find that while there’s no official schedule to stick to, you find yourselves a lot busier in summer than you do throughout the year. You try to fit in all of the things and go to all the places that you can’t go to during the school year and end up on the go with your family a lot. Being on the go with our crew always involves food. It never fails, we’re barely even out of the driveway, let alone off our street before one of the girls is complaining that they’re hungry and chances are, they’re not making a plea for a healthy snack. 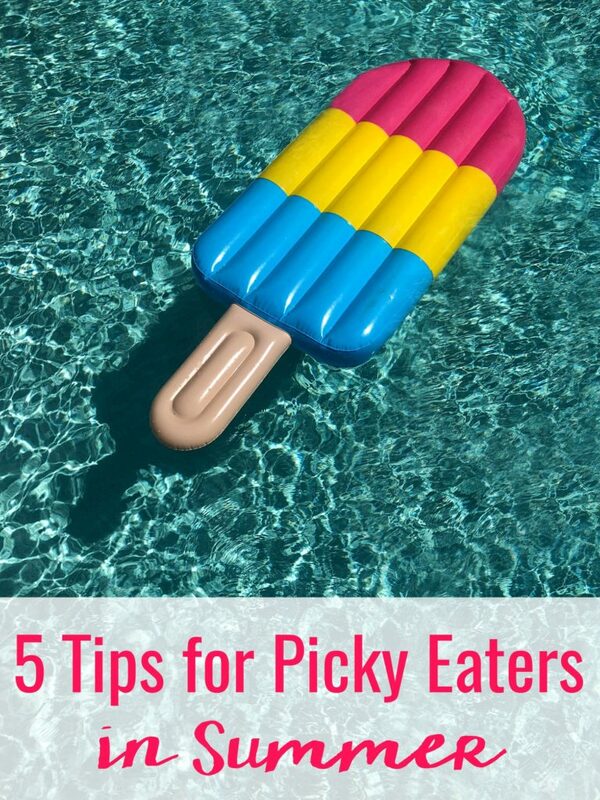 While we do let them indulge, as parents it’s our responsibility to ensure their little bodies are getting the things they need to stay healthy but that can be a challenge sometimes when you’re on-the-go, so today I’m sharing 5 parent tips for picky eaters in summer! 1. Create a rule to try new things. In our family, you have to at least try one bite of a new food before saying you don’t like and/or you won’t eat it. This means our kids are constantly trying new foods and expanding their palettes and as we reintroduce these foods, they’re trying these foods again. Sometimes they find they like a food they didn’t previously and sometimes we find out that a food is a no-go. 2. Ensure you’re giving your kids plenty of the good foods they do like. I know it can be tempting to buy certain foods only when they’re on sale so you’re getting the best buy. But sometimes your kids like something that is rarely or never on sale. If you can, lean into these cravings where you can afford them to ensure your kids are getting the base foods that your children enjoy. 3. Incentivize trying foods they may be on the fence about. Sometimes kids like something, but maybe it isn’t their favorite. Finding a way to ensure they’ll enjoy the food by offering another food to compliment it is the way to go, such as hummus for eating carrots, ranch dressing for eating carrots, or peanut butter for eating apples. Or, go completely to the incentive by rewarding your child for trying a certain food by giving them a special dessert. 4. Make sure your kids are hydrated. Sometimes picky eaters also refuse water, which can create an even more difficult challenge. Stressing the importance of water to your child will lay the groundwork for healthy habits later in life, try to make drinking water fun by adding fruits or herbs to infuse the water with a little flavor, serving it with a straw, giving them their own special water bottle, or turn drinking all of your water into a game by drinking water with them! 5. Fill in the gaps with One A Day with Nature’s Medley for Kids. As parents, it’s so easy to guilt ourselves over the things our kids aren’t eating. Needing parent tips for picky eaters is a very common issue and one that our pediatrician has said she hears often. Your kids will survive childhood, even with their disjointed diets if you’re consistent and continue to offer variety. But when you’re fearful your child isn’t getting all of the vitamins and nutrients they need through the foods they eat, there’s no reason to stress. I feel reassured knowing that my girls are taking One A Day Kids with Nature’s Medley. It’s the only complete multivitamin with plant-based antioxidants from one total USDA serving size of fruits and vegetables – and it’s also free of artificial flavors and sweeteners with colors from natural sources. 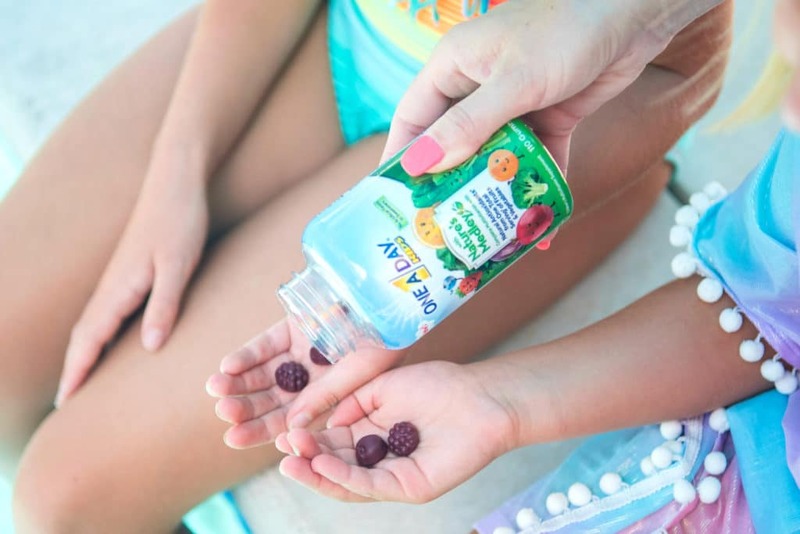 My girls love the flavor of One A Day with Nature’s Medley for Kids and I love I don’t have to fight with them to take their vitamins and that they’re available at Walmart. One A Day with Nature’s Medley isn’t just for kids ages 4-11, there’s also a unique formula for men and women as well. As hard as I try, I know my husband and I still don’t get in all of the nutrients we need from food alone, especially during the summer when we’re on-the-go, so we also need a little help ensuring our bodies are getting all we need as well. What are your favorite parent tips for picky eaters?